In this presentation Associate Professor Andrew Jamieson will discuss the Nimrud ivories in the Classics and Archaeology Collection at the Ian Potter Museum of Art. At Nimrud in Fort Shalmaneser, archaeologist Sir Max Mallowan and his wife Agatha Christie discovered store rooms filled with thousands of ivory pieces. Others were found discarded or dumped in wells. Agatha Christie helped photograph and preserve many of the Nimrud ivories and records in her autobiography that she cleaned them using a fine knitting needle and a pot of face cream. The University of Melbourne has three Nimrud ivories, believed to have been assigned to the then Department of Middle Eastern Studies in acknowledgement of the financial support given to the British excavations (1949–1958). Andrew will also examine the Neo-Assyrian ivories from the University of Melbourne excavations at Tell Ahmar on the Euphrates River in northern Syria. Join us for this rare opportunity to see both the Nimrud and Neo-Assyrian ivories on display as we bring them up from the vaults. Dr Andrew Jamieson is Associate Professor in Near Eastern Archaeology at the University of Melbourne. He has worked at archaeological sites in Egypt, Syria and Lebanon. For ten seasons he was involved in the Australian salvage excavations at Tell Ahmar (ancient Til Barsib) in northern Syria. He specialises in the study of ancient ceramics – Bronze and Iron Age pottery – and is interested in archaeological collections management practices. 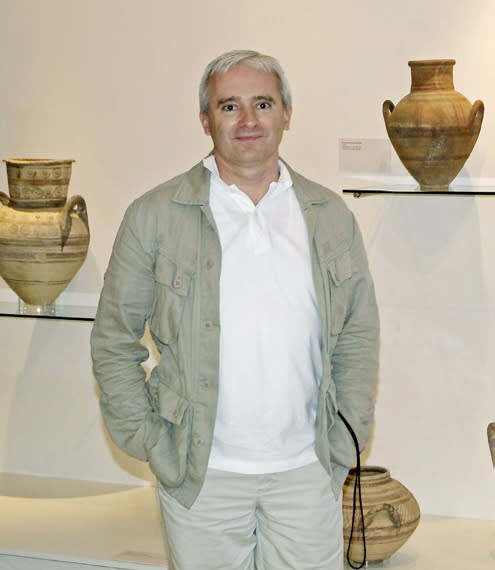 He is the author of Tell Ahmar III: NeoAssyrian Pottery from Area C, published by, Peeters Press in Leuven (2012). In 2015 Andrew won the Barbara Falk Award for Teaching Excellence; objectbased learning is an integral part of his teaching practice. As the curator of the Classics and Archaeology collection, he curated 22 exhibitions at the Ian Potter Museum of Art.